- Laminating speed control . - Extruding speed setting . - Laminating parameter setting . - Operation temperature setting . - Driver status monitoring . - Production additives saving . - Malfunction warning information . - Tension information monitoring . - Automatic unwind tension control . - Diameter detecting control . - Dancer roller tension control . - Automatic cutting roll change. - Jointing gluing surface check . - Automatic pre-drive jointing . - Automatic infeed tension control . - E/P transducer control . - Automatic rewind tension control . - Rewind tape tension control . - Automatic cutting roll change . - Non-stop roll change ..
- Automatic length counting . - Automatic outfeed tension control . *All specifications, dimensions and design characteristics shown in this catalogue are subject to change without notice. *Above control system is suitable for rotogravure printing machines. Control components are provided according to customer's requirement. *Control systems for other printing machines are available. Contact us for further details. 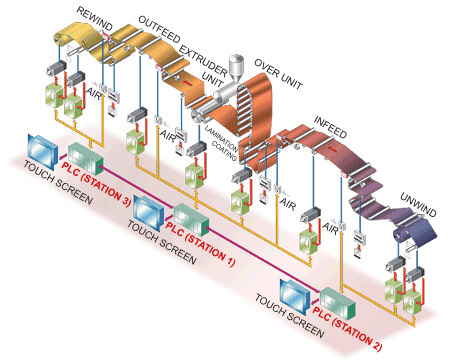 This is the detailed information for Extrusion System Lamination Machine Control System. The information includes model, name, description and specification for Extrusion System Lamination Machine Control System.